My parents are celebrating their 49th (yes, 49th!) wedding anniversary this week, so I put together a card for them to mark the occasion. The layout for the design comes from the current challenge at Sunday Stamps. I replaced the sketch's large round panel with a deep red pierced heart die cut. The die cut was adhered to a sparkly silver cardstock strip positioned near the bottom of a gray dotted patterned paper panel. The "happily ever after" sentiment from the My Favorite Things Essential Sentiments set was stamped in silver ink on a dark gray panel, then heat embossed in silver for a shiny pop against the dark background. I used foam tape to adhere it over the heart. A trio of silver glitter enamel dots were arranged above the heart as an accent. The finished panel was adhered to a pale gray card base. Wow, 49 years, that is awesome! Happy Anniversary to them! Lovely job on the card, you created CAS perfection! Simple and great using of our sketch. 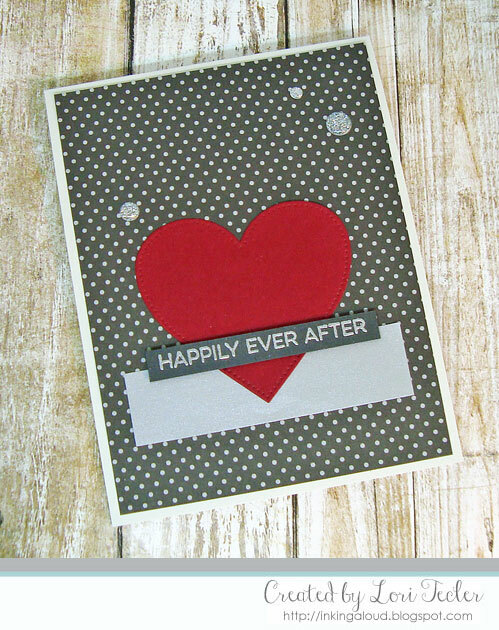 Love this CAS design and that you've used the heart as the focal point from our sketch challenge. Happy 49th anniversary to your parents...mine just celebrated #52!